The Chamber is located at 220 N Main Street in the lower level of the State Bank Building. Paulding is the county seat of Paulding County, Ohio. Residents incorporated Paulding in 1872, although numerous people lived in the community prior to that date. Residents named the town in honor of John Paulding, a hero of the American Revolution. Paulding helped capture Benedict Arnold, the most notorious traitor in American history. Paulding County and its county seat grew slowly. In 1840, Paulding County was Ohios least populous county. 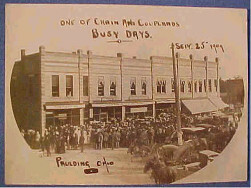 The town of Paulding contained only two families. The principal reason for this small population was water from the Great Black Swamp and from a water reservoir for the Miami and Erie Canal and the Wabash and Erie Canal covered much of the county. It was not until 1887 that residents were able to drain most of the Great Black Swamp and the reservoir, opening the land to farming and further settlement. 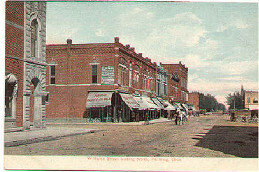 In 1880, only 454 people resided in the village of Paulding. In 1890, thanks to the draining of the reservoir and the Great Black Swamp, the county seats population increased to 1,879 people. 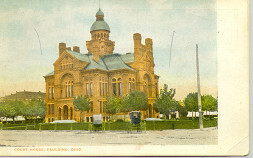 In 1886, Paulding had two newspaper offices, three churches, and two banks. Most manufacturing businesses produced items from the abundant forests surrounding the town. Two wooden hoop and barrel stave factories, two sawmills, one hub and buggy spoke factory, and two wagon and buggy manufacturers existed in the community. One of the wooden hoop and barrel stave factories paid its workers thirty cents for every one hundred hoops that a worker completed. An average worker could complete five hundred hoops per day. Want to receive Updates on Chamber events? Complete your profile and you will receive information from the Chamber. The Chamber's Weekly Updates is full of information about what is happening in our community. The Flat Rock Fall Festival Updates happen mostly around the festival and will include schedules, special information, deals and more!